By Michael Collins: Unbeaten #4 WBC heavyweight contender Tyson Fury (19-0, 14 KO’s) will be taking a big step u in competition against former heavyweight title challenger 33-year-old Kevin Johnson (28-2-1, 13 KO’s) on December 1st at the Odyssey Arena, in Belfast, Northern Ireland, United Kingdom. Johnson has fallen out of the top 15 since losing a lopsided 12 round decision to WBC heavyweight champion Vitali Klitschko in December 2009. However, Johnson remains a tough out for a guy like Fury simply because of Johnson’s superb jab, good left hook and experience. Believe it or not, Johnson is a huge step up for the 24-year-old Fury, who has been matched very, very carefully by his promoter Mick Hennessy during Fury’s four year pro career. Vitali couldn’t knock Johnson out because he adopted a defensive survival oriented strategy by going to the ropes and spending pretty much the entire fight just covering up in a rope-a-dope posture. What made it even more difficult for Vitali was how Johnson was leaning his head far over the ropes to keep from taking head shots. It was a clever maneuver by Johnson but it ultimately took away his chance to win the fight. If Johnson does this against Fury then there will be little chance of the light hitting Fury to get a stoppage. Johnson could give Fury a lot of problems in this fight if he stays in the center of the ring and jabs him. While Fury has a three inch reach advantage over Johnson, it’s Johnson has the far superior jab of the two. Johnson could end up blistering Fury’s face up something fierce if he stays in the center of the ring and shoots out jabs all night. Fury was supposed to be fighting #3 WBC Denis Boytsov. However, Boytsov didn’t have enough time to get into shape by December 1st, so he pulled out of the fight. 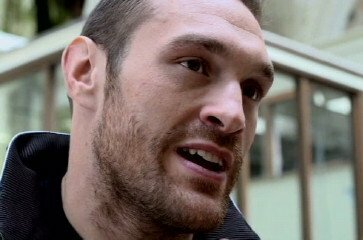 Fury and Boytsov will still likely meet up in February of next year in a possible World Boxing Council title eliminator. In his last fight, Fury defeated journeyman Vinny Maddalone by a 5th round stoppage. Fury has taken his career backwards in his last four fights after defeating Dereck Chisora last year in July. Since that fight, Fury has beaten the following heavyweights: Nicolai Firtha, Neven Pajkic, Martin Rogan and Maddalone. Previous boxing news: Will Virgil Hunter make a difference for Amir Khan?